Hackett was born in New York City, the son of actress Florence Hackett (née Hart) and Maurice Hackett. He attended Professional Children's School and started out as a child actor, appearing on stage and in films. His brother was actor Raymond Hackett. Their stepfather was the early film actor Arthur V. Johnson who married their mother Florence circa 1910. His sister-in-law was Blanche Sweet who was Raymond's second wife. Not long after marrying screenwriter Frances Goodrich, the couple went to Hollywood in the late 1920s to write the screenplay for their stage success Up Pops the Devil for Paramount Pictures. In 1933 they signed a contract with MGM and remained with them until 1939. Among their earliest assignments was writing the screenplay for The Thin Man (1934). They were encouraged by the director W. S. Van Dyke to use the writing of Dashiell Hammett as a basis only, and to concentrate on providing witty exchanges for the principal characters, Nick and Nora Charles (played by William Powell and Myrna Loy). The resulting film was one of the major hits of the year, and the script, considered to show a modern relationship in a realistic manner for the first time, was considered to be groundbreaking. However this is only because it was written and released before the enactment of the Hollywood Production Code, which strictly censored movies from mid-1934 until the early 1960s (see Pre-Code). The other Nick and Nora films show a steep decline regarding the "groundbreaking maturity" of the Charleses' marriage. 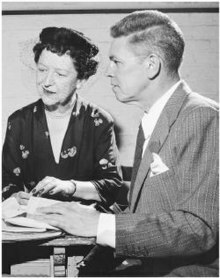 The Hacketts received Academy Award for Screenplay nominations for The Thin Man, After the Thin Man (1936), Father of the Bride (1950) and Seven Brides for Seven Brothers (1955). They won Writers Guild of America awards for Easter Parade (1949), Father's Little Dividend (1951), Seven Brides for Seven Brothers (1954), and The Diary of Anne Frank (1959), as well as nominations for In the Good Old Summertime (1949), Father of the Bride (1950) and The Long, Long Trailer (1954). They also won a Pulitzer Prize for Drama and the New York Drama Critics Circle award for their original play The Diary of Anne Frank. Some of their other films include: Another Thin Man (1939) and It's a Wonderful Life (1946). "Albert Hackett Biography". filmreference. 2008. Retrieved 2008-12-17. "Frances Goodrich and Albert Hackett". filmreference. 2008. Retrieved 2008-12-17. Holmstrom, John. The Moving Picture Boy: An International Encyclopaedia from 1895 to 1995, Norwich, Michael Russell, 1996, p. 16. Wikimedia Commons has media related to Albert Hackett.